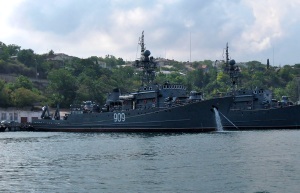 Vice Admiral Zhukov (hull number 909) is a Project 266M Aquamarine ocean-going minesweeper. Vice Admiral Zhukov (serial number 951) was laid down at Sredne-Nevskiy shipyard. Commissioned on January 30, 1978. Before March 17, 1985 named as Elektrik.